Microsoft has confirmed that it will be removing a Wi-Fi network sharing feature from Windows 10 with an upcoming update. The feature allows you to share Wi-Fi login information with friends automatically via your contacts, however it got a controversial reception due to privacy implications. Do you really want to share your Wi-Fi codes with everyone in your contacts? No, of course not. It seems that was the general response from users too, so that option will be removed in the upcoming Windows 10 Insider Preview update, Microsoft says. Public Wi-Fi login info will remain in the app though. The cost of updating the code to keep this feature working combined with low usage and low demand made this not worth further investment. 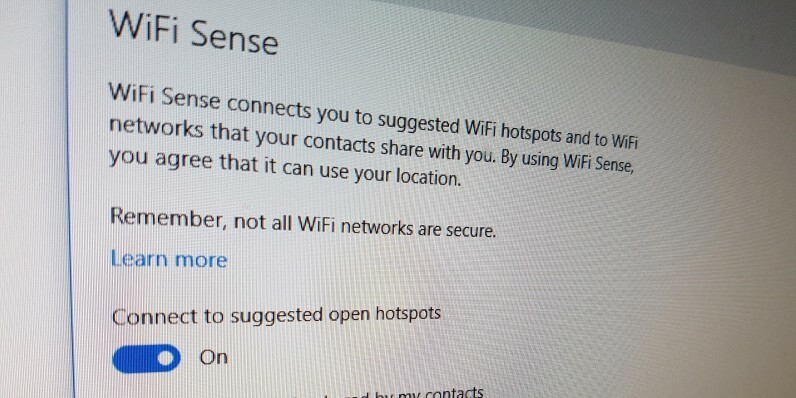 Wi-Fi Sense, if enabled, will continue to get you connected to open Wi-Fi hotspots that it knows about through crowdsourcing. Among other changes for early adopters is support for downloading Edge browser extensions from the Windows Store rather than from a local file. As a result, anyone who has extensions installed already will need to reinstall it this time from the Store, but won’t need to uninstall and reinstall manually again in the future. Adblock and Adblock Plus Edge extensions have also been launched with the new build.